The auratus cichlid is a freshwater fish that’s also known as the golden mbuna or Malawi golden cichlid. This fish is a very aggressive fish that is native to Lake Malawi in Africa. The auratus cichlid has an oval body. 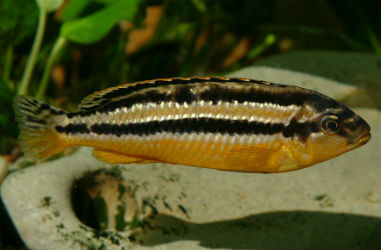 The females of this species have black and white horizontal stripes and a yellow body. 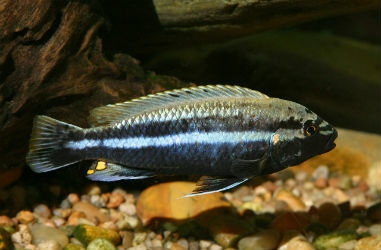 The males of the species are dark blue with lighter bluish or silvery stripes. The auratus cichlids are pretty small in size, only growing to be a few inches long. This species of fish is one of the most popular types of fish for aquariums, but the aggressive nature of the auratus cichlid means you’ve got to be very careful about what you put in your aquarium with it. 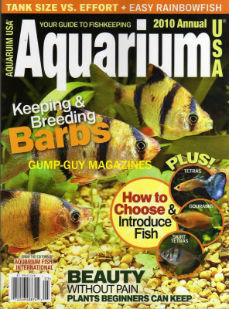 If you decide you really want an auratus cichlid, it’s best to purchase one male and several females. This will prevent the male of the species from attacking the other fish. However, it is still possible that the male will attack the females, even if he is the only male, so don’t be surprised if one day you discover that the male of the species has killed one or two of the females. The males are so aggressive they will even pick fights with fish that are much larger than them, so just remember that no fish, no matter how big, is completely safe from the attacks of this fish. You may have a difficult time finding males of this species in a pet shop because many shops won’t stock the males. This is because of an interesting characteristic all auratus cichlids have. They can actually change genders! Often the most dominant female inside an all-female tank of auratus cichlids will turn into a male. Males don’t usually turn into females. You may want to purchase several females just so you can have the experience of watching one of them transform into a male. You will know when it has happened because the auratus cichlid’s color will change from the female coloration into the male coloration. Another important thing to keep in mind when you’re setting up a tank for an auratus cichlid is that you don’t want to have any real wood in the tank. Wood makes the water acidic, and this species of fish prefers hard water and algae. A high pH is best in a tank that contains these fish, so you want to avoid having other fish that need water with a low pH. Another thing to keep in mind when you’re setting up a tank for this species of fish is that you want to have plenty of rocks and caves for the fish to hide in. The good thing about the fish of this species is that they do eat algae. 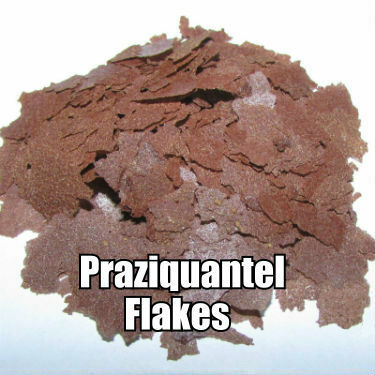 However, you will still need to feed them regular food because they need more to eat than the amount of algae that occurs naturally in your tank. The auratus cichlid will usually eat whatever you feed to it.